The Sand Island petroglyph site is one of the large sites that I have visited numerous times and I always seem to find something new on each visit. There is just so much to be seen here if you study the site closely. 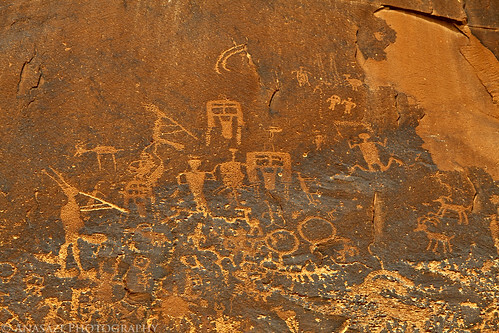 The main reason I am posting this photo today, which only shows a small section of the panel, is because of the mask-like petroglyphs that can be seen close to the center. These masks are very similar to the Green Mask pictograph that I posted a photo of yesterday.